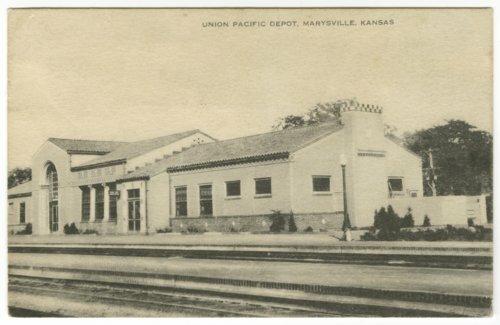 This series of photographs show the Union Pacific Railroad depot in Marysville, Kansas. This Spanish-Revival style depot, built in 1929, designed by Gilbert Stanley Underwood features stucco walls with terra cotta ornate accents and a pantile covered roof. The depot had been a hub for transportation until the 1950s when passenger rail services ended. The building had been vacant since 2009. In 2010 a group of concerned citizens formed a non-profit community preservation group called Landmark Enterprises with plans to restore the depot into a community events center. The group was unable to raise the money to buy the structure. In January of 2014, the Marysville Union Pacific Depot Preservation Society purchased the building for $20,000 from the city with plans to restore it to its "former glory." The building was refurbished and added to the National Register of Historic Places on October 11, 2016.